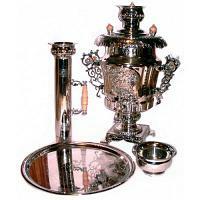 Samovar is a truly national symbol of Russia. Originating in the 18th century, this metal container for boiling water quickly became popular among all social classes. Heated using coal, wood, and kerosene, it was a handy tool in a nation so fond of tea, which finally became affordable to everyone since being first introduced to Tsar Michael I by a Mongolian ruler back in 1638. 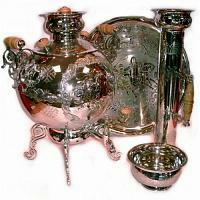 Early samovar makers were based in Tula. Subsequently, the city with many of its now-famous residents (Lyalin, Lomov, Rudakov, Batashev, Teile, Kapyrzin) became the center of all production. Variety of shapes, volume, and decoration rapidly increased. Nowadays, electric heating elements in samovars are replacing traditional parts due to basic usability. In addition to plain nickel-plated brass models, we are offering beautiful hand-painted sets.